During the course of planning the party, we have received a plethora of fabulous gifts to give away to lucky winners. We did a day by day prize countdown on Facebook and twitter are pleased to now present them here as well. 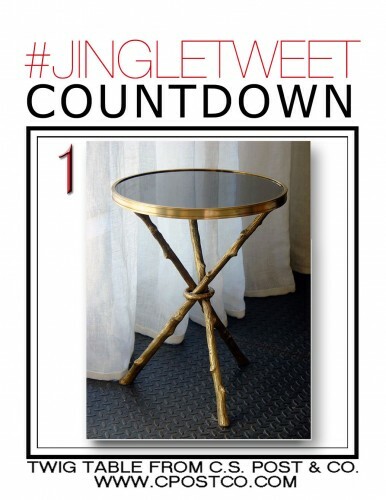 At number one in the countdown is this gorgeous twig table from generous retailer CS Post. This handsome piece would enhance any style decor! I love their eclectic wares and wrote about them and their amazing back story here. 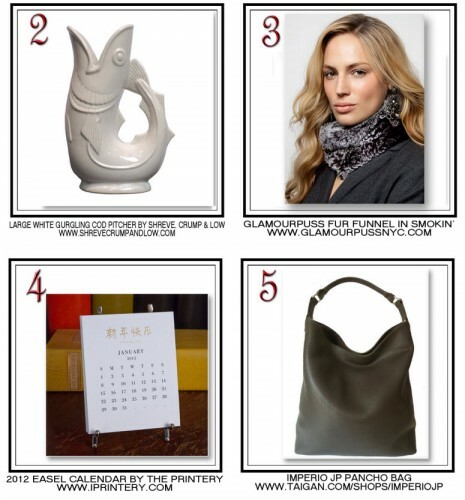 Shreve Crump and Low, American’s oldest jeweler, donated their iconic Gurgling Cod pitcher – a classic gift appropriate for anyone on your list, while some lucky fashionista will be going home with Glamourpuss‘ chic and easy original fur funnel – a gorgeous way to stay warm and stylish all winter long. Stationer The Printery has been selling their elegant designs to customers from their 18th century building in Oyster Bay, NY and at select retailers for the last century. Their lovely easel calendar would be a classic addition to any desk! It’s no secret that Taigan is one of my favorite online stops. I discovered the beautiful wares of Imperio jp there and we’re thrilled they offered their beautiful Pancho bag for our event!! You can read about my visit to this special emporium here. I have long admired Katie Ridder’s distinctive style. I recently reviewed her new book here and can unequivocally say it is one of the most beautiful interior design books of the season – the lucky winner will have the perfect addition to his or her design library. Assouline occupies a unique niche in the publishing world that I have always found inspiring. They aren’t just curators of culture but leaders that drive it. Assembling the most creative minds today, their aesthetic ethic is impressive. 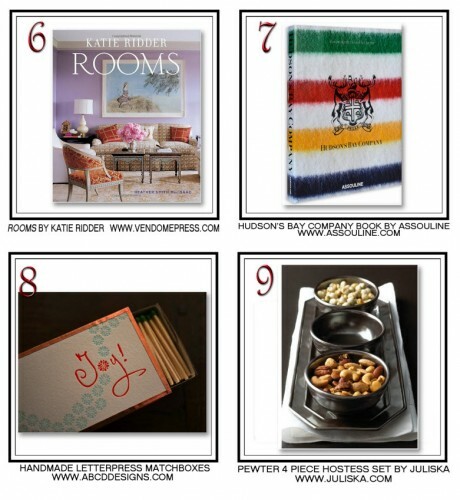 The Hudson’s Bay Company book is the ideal accompaniment to a long winter’s days lounging by the fire! Amy Beth Cupp Dragoo is the creative force behind ABCD design. An artist, designer and stylist, Amy created these beautiful letterpress matchboxes for the holidays. 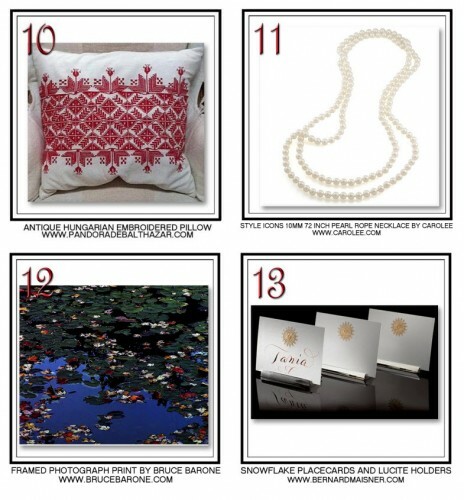 A beautiful prize to keep or give as a hostess gift, three lucky winners will be going home with one! Juliska is a name synonymous with stylish home accessories. Their design philosophy of “beautiful, functional and luxe for chic everyday living” is a mantra perfectly exhibited in their elegant pewter hostess set. As the creative director for Pandora de Balthazar’s website, I am very familiar with her unique, beautiful products, which you can learn more about here. This fabulous antique Hungarian embroidered pillow is just one example of the thousands of antique textiles she has collected in her career. Her sleep products and linens are a must have for those who seek the best! For over 35 years, Carolee had been a leading brand in fashion jewelry, whether modern, fashion forward, or classic like these timeless pearls. With an appealing versatility, this 72″ strand is a perfect addition to anyone’s jewelry wardrobe. Bruce Barone is an artist specializing in portrait, nature and documentary photography. His work has been described as “distinctive photography with soul” for good reason! Bruce has generously donated a stunning print framed for the lucky winner! Bernard Maisner is an internationally renowned calligrapher and stationer. His luxurious stationery and accessories are sought after by those in the know everywhere and carried at such premier retailers as Bergdorf’s and Gumps. He has offered a lucky winner a set of spectacular snowflake place cards with elegant lucite holders. Please visit Ridgely’s blog to see the other 12 prizes and a great giveaway contest we are offering to those unable to attend the event!! We are so grateful to the incredible generosity of all our donors and look forward to seeing everyone tomorrow night to share a little holiday cheer! We’ll be sure to report back! This entry posted in bags, books, design, entertainment, fashion, food and drink, furniture, gifts, holiday, photography, Stationery. Entry Tags: Glamourpuss Fur Funnel, Gurgling Cod Pitcher, Hudson's Bay Company Book. abcd designs, Imperio JP, Juliska, Katie Ridder Rooms, Pandora de Balthazar, Shreve Crump and Low, Taigan, The Printery Bookmark the permalink. How exciting! I can’t wait to see and (virtually) participate! I cant believe it is finally here… #JingleTweet! Thank you for making this so fun to put together. Cheers! Have fun tonight! I really wish I could be there…. Everything you do, Q, is infused with excellence and style. I’m sure tomite’s tweet-ala-gala-up will be of the same breed!! The prizes are a hint of the festivities to come. I can’t wait to see the photos. Most importantly, though, what will you be wearing? Cheers!! Fun but unfortunately I don’t tweet! Because of my lifestyle I’ve never needed a cell believe it or not. I’m loving that pancho bag so I’m off to find it! Oh…so many goodies…maybe the stars will align for me toinght.. Thanks again for all your efforts in putting this together. Holiday Spirit in abundance here! I’m a JingleTweet newbie, but eager to learn and properly take part! Loved seeing the tweets….and can’t wait to find out who won the treats. Some from my absolute favorites. Congratulations on pulling it all together!! Unbelievable! Cannot get over all of the goodies! so many goodies…know it will be a fabulous evening…can’t wait to hear!! 79 queries in 0.449 seconds.